Article by Louise Phillips © 12 November 2015. 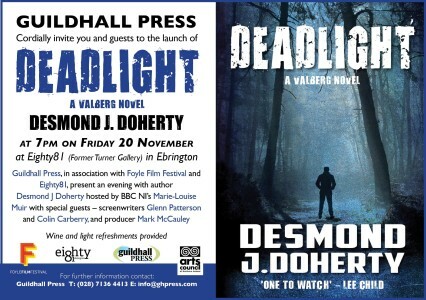 Publishers Guildhall Press will launch Desmond Doherty’s third Valberg novel, ‘Deadlight,’ on Friday the 20th November at 7 p.m. at the location of the book’s dramatic opening scene in Ebrington in Derry. The Valberg titles have been praised for their visual and cinematic style, and have recently been optioned by Revolution Films in London. They will be adapted for screen by award-winning writing duo, Glenn Patterson and Colin Carberry. Patterson and Carberry will be at the launch, which is being hosted by BBC Arts Extra presenter Marie-Louise Muir. 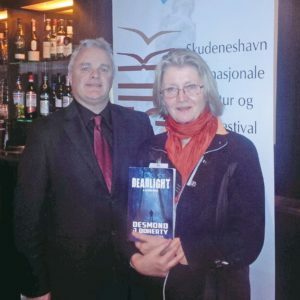 Des Doherty with the late Steig Larsson’s partner, Eva Gabrielsson, at the Sil Book Festival launch.